by Sandra Webster, SSP national co-spokesperson The morning after the night of the referendum, Cameron left Downing Street to promise to keep the vow to the Scottish people but with a caveat. More powers for Scotland should mean more powers for England. Let the buyers beware, we knew that the Smith Commission was nothing more than devo max at its very best. I listened to the live reporting of the recommendations. It took place in a museum in Edinburgh. How ironic that it should have been announced in a building full of old fossils. What this really means is our block grant from Westminster will be decreased. We in Scotland spend more on public spending per capita than the UK who have just this week announced they will be cutting public spending to rates not seen since the 1930s but this is the deal we have agreed too. Those who spoke for us did anyway. There are some positives—16 and 17-year-olds will get the vote in Scottish elections. Some benefits relating to people with disabilities and those who care for them will be devolved. Scotland will still have control over easing the aftermath of government policies such as the Bedroom Tax. Fracking licences will be a matter for the Scottish Government. Also, of course, we have control over road signs—I hope we use them wisely. The tax-raising powers we have been given do not mean additional money in our purse since it will be taken off the block grant. When listening to the Smith Commission I was struck by the words of Maggie Chapman, a politician I have respect for. Given though that each party only had a few minutes to speak, she used the word “collaborate” and that every party on the Commission would be held accountable for their actions by the Scottish people. I agree with her and also think that the Smith Commission, rather than destroying the hope of independence, has left us all wanting more. Some may be saying that we shouldn’t keep alive the prospect of hope for another referendum in our own lifetime but we as a country have grown up during the referendum. We are no longer prepared to accept that what is given to us and that is a good thing. We can see beyond the findings of this Commission. 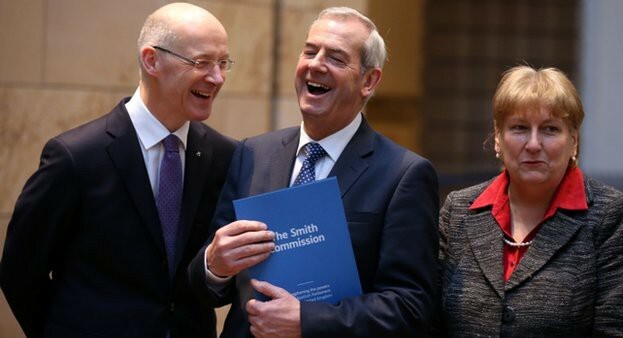 The Smith Commission sought its findings by talks with five political parties but we know there are many other folk out there to discuss our future with. Many have been awakened by the referendum and will not be silent again—they want to be part of a discussion, not follow orders barked from a Westminster government. The SSP have a responsibility to ensure more voices are heard and continue to campaign for our vision of an independent socialist Scotland—anything else is not good enough. What difference does this talking behind closed doors make? We are on the side of those who need a more equal Scotland, not just one that is invented for us.